Tonight I found out about the unexpected death of the great Robin Williams. It was shocking and upsetting to hear that it was believed that Williams had recently suffered from severe depression and that he was believed to had committed suicide. I guess I can say that I almost met Williams when I was in Iraq, in between missions at Ta’Qaddum airbase west of Fallujah in 2007. 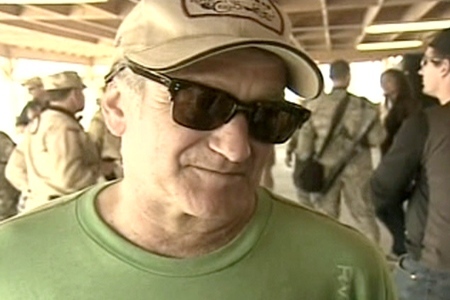 Williams was with a number of celebrities and the former chairman of the Joint Chiefs of Staff, Admiral Mike Mullen touring Iraq and Afghanistan. I had just come in from a mission and could not see his show, but the following morning I walked by Williams as he was walking back from the dinning facility. I recognized him, but I am loathe to interrupt a person’s time alone. I simp gave him a “good morning” which he returned and both of us went on our ways. I could have stooped him and detained him, but in good conscience could not do it. My friend Fr Jose Bautista, a Navy Chaplain had Williams and Lance Armstrong sign a baseball cap for me. I treasure it. Robin Williams was brilliant, talented and brought much you to many people. Unfortunately. like so many brilliant and caring people he was afflicted with his own personal “demons.” He struggled with depression ands substance abuse. I understand. Since returning from Iraq in 2008 I have dealt with the effects of PTSD, including depression, anxiety, hyper-vigilance, insomnia, nightmares and night terrors. I know why people commit suicide, and at times considered it myself. Most recently less than two weeks ago when dealing with the inhuman machine that is the Navy mental health system, something that is common to the rest of the military and VA systems. The fact is that depression is a killer and it disproportionally afflicts the most talented, brilliant, artistic and insightful people. Van Gogh, Hemingway, Williams and so many others, including men and women that distinguished themselves in combat, some of whom I knew, have taken their lives. The death of Robin Williams has shaken me. I pray for his wife and children and all those who loved him, or who were touched by him. Please, if you are suffering from anything that makes you think that suicide is the only option, please seek help. If you have no one else, contact me. I may not be able to do much but I will listen. You are not alone. Rest in Peace Robin Williams. You brought much joy to my life and to so many others. I am also sad about Mr. Williams. Depression is no joke, I pray for you Padre.You keep the faith and if you need a ear, please find me. Thanks Rob, it briefly went thru my mind as a way to protest how active duty and veterans are treated by the mental health systems of the military and VA. I quickly discarded it. I agree with Chad, you are a beacon of light and your work is so important. I know how quickly a thought can flash in your mind about doing something. I honestly understand your reasoning and I have no concerns about that. But I am always concerned with the thoughts that cant be explained. The thoughts that are tempting, you will be happier, end the pain, suffering or just giving up. Those thoughts scare me because they are like the ocean waves. They are always there, wearing us down until we do something like Mr. Williams. If you want a 24/7 number of someone who cares and will listen to you. Send me a e-mail at robakers19@gmail.com and I will give you my number. Nights are the worse time, I know. I am a vampire and I work nights so most of the time I am available. When Im at home, I am usually up past 2 AM EST. If you need someone to listen and cant find anyone else, I am usually up. I too have dealt with the mental health systems and appalling is not an appropriate adjective. Please keep the ‘faith’ (please excuse the pun, Padre) I only prey every night for my brothers and sisters that need the assistance that is needed so much, but provides so little. Your blog is a beacon and somewhat therapeutic for me and my wife. Please keep reporting Padre; I most defiantly will be reading.